The referendum will have long-term implications for Indian companies, which earn a substantial portion of revenue from the region. The Indian currency and stock markets, and companies with European exposure, remained on the edge as the UK goes to vote on a referendum to remain or exit the European Union (EU) on Thursday. Apart from roiling the currency and stock markets, the referendum will have wide-ranging, long-term implications for Indian companies such as Tata Steel and Tata Motors and information technology (IT) services companies, which earn a substantial portion of their revenue from the region. 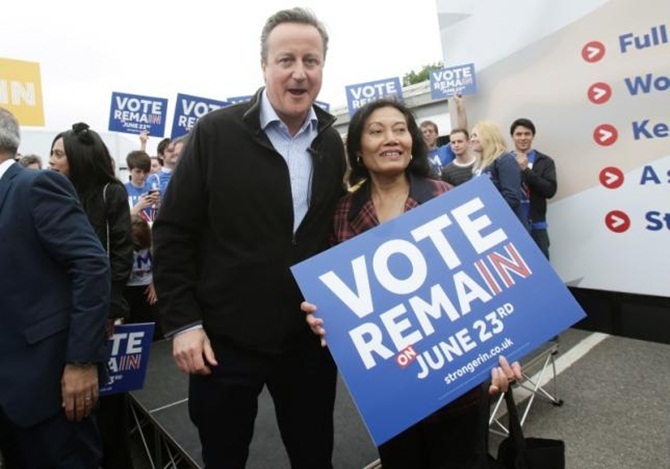 While opinion polls suggest a neck-and-neck race between the two camps, the referendum initiated by British Prime Minister David Cameron, as part of his 2015 election manifesto, is causing deep concerns at home. "This is an unprecedented event that will have impact on cost, labour and capital. If the UK decides to leave, the risk aversion that would set in will take money away from emerging markets to safe havens like the US and Japan. India will see some dislocation in the market in the short-term," said Arvind Narayanan, executive director and head of treasury at DBS Bank, India. The rupee closed at 67.49 versus the dollar, down 17 paise over Monday's close. The 10-year bond closed at a yield of 7.50 per cent level, about the same level as the previous day. Stock market analysts said if the UK were to exit the EU, it could change the equation dramatically. "After the US Federal Reserve, it is a major event that is followed by the investors across the globe. Europe would be on the verge of a meltdown, if Brexit happens," says U R Bhat, managing director, Dalton Capital Advisors. The prospects of Brexit have impacted the oil markets too. In the eventuality of a Brexit, analysts expect a 10 per cent further fall in oil prices in the near future. Executives of Tata Motors-owned Jaguar Land Rover (JLR) and Tata Steel Europe cautioned their British employees about exiting the EU. JLR chief executive officer Ralf Speth said the UK leaving the EU would be "highly damaging" for the company and would make buying components and selling products in the EU more difficult, which is its largest market. "Remaining in the EU will increase chances to grow, create jobs and attract investment," Speth said. Europe accounts for 57 per cent of Tata Steel's consolidated revenue. Another worry for Indian companies is the prospects of a fall in the British currency's value, if it exits the EU. It could result in lower incomes for IT companies like Tata Consultancy Services (about 16 per cent of its revenue comes from the UK) and Tech Mahindra (15 per cent of revenue), which earn significant income from the UK. The good news though is that the punters are betting that the UK will vote to stay in the EU. While the opinion polls are split mid-way, Ladbrokes betting barometer based on live odds was predicting a 76 per cent chance that the UK would stay in the EU at 5.00 pm IST on Tuesday. While the British public is evenly split, according to latest opinion polls, the main grouse is that many believe Britain is unable to grow because of its association with the EU. They also want Britain to take control of its borders and reduce the number of migrants coming into the country to live and work - a marked difference from the key principle of the EU, which allows for free movement of goods and people. It is an economic and political partnership, involving 28 European countries. It has become a single market, allowing goods and people to move around member countries. While the UK has maintained its own currency in the British pound, most other member nations use the euro. The EU has its own parliament. The UK ranks 12th in terms of India's bilateral trade with individual countries. It is also among just seven in 25 top countries with which India enjoys a trade surplus. According to commerce ministry data, India's trade with the UK was worth $14 billion in 2015-16, of which $8.83 billion was in exports and $5.19 was in imports. The trade balance thus, was a positive $3.64 billion. It is also the third largest investor in India after Mauritius and Singapore, with a cumulative inward flow of $22.56 billion between April 2000 and September 2015. Infotech companies and the Tata Group have strong businesses in the country. A fall in the pound would hurt them. They will have to set up separate offices in other EU countries. Work-related visa restrictions have already resulted in a fall in the number of Indian students studying in British universities from 22,385 in 2012-13 to 18,320 in 2014-15, according to the UK Council for International Student Affairs. In 1983, too, when UK's Labour Party campaigned in general elections with a promise to withdraw from EEC, it was defeated badly by the Conservative Party of Margaret Thatcher.